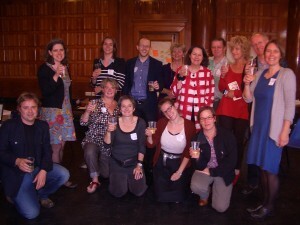 The first Happy Museum Symposium was held in Suffolk in January 2012 see here for the full Happy Museum Symposium Report and a Storify of tweets from the event here. 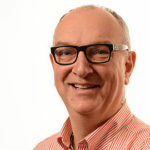 In addition the following piece by Tony Butler was published shortly afterwards on Guardian Cultural Professionals and the various blogs referenced within are a good starting point to the challenging discussions that took place. Last March we published The Happy_Museum_report: A Tale of How it Turned Out Alright, a paper co-written by the New Economics Foundation and leading museum commentators. Its concluding ?manifesto for well-being’ argues that museums have innate qualities which can inspire a re-imagining of a society which values co-operation and stewardship of our surroundings as much as it does economic well-being. In her her speech to the Museums Association conference in Brighton in 2011, Caroline Lucas, Britain’s first Green MP quoted extensively from the paper making the links between museums and sustainability. Museums should take advantage of the widespread sense of public trust which they enjoying, their position as public spaces and their status as a sanctuary from commercial messages ?with little to sell but understanding and enjoyment? (apart from the ubiquitous gift shop). The paper concluded with the Manifesto for Well Being a set of 8 principles, (perhaps not as pithy as Dea Birkett’s Kids’ in Museums Manifesto) which provides a starting point for creative inquiry. 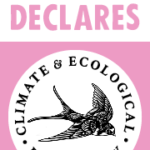 They examine how museums might cement the linkage between well-being and environmental sustainability, how they might pursue more mutual relationships within civic society and how they might better articulate the possibilities of a good life to help people in the transition low-carbon world. In order to test the Happy Museum proposition we commissioned six museums to carry out a variety of projects which seek to better connect people and institutions with each other and their environment. Amongst them are the London Transport Museum which is working with St Mungo’s homeless charity to create a Conversation Hub within the museum. Godalming Museum which is connecting with a variety of civic society groups including Transition Godalming to explore the towns hydro-electric heritage and The Story Museum Oxford is working with psychologists and well-being experts to influence designers and architects as they engineer their new capital developments. 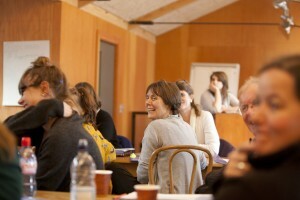 There is also much to reflect upon following last week’s Happy Museum symposium at Snape in Suffolk. Participants included leaders from the Arts Council, British Council, Museum and Galleries Scotland and Museums Association. They were ably provoked by Paul Allen from the Centre for Alternative Technology in Machynlleth and Andrew Simms from New Economics Foundation who posited that despite decades of economic growth our wellbeing is flatlining. Museums, they agreed can play an active role by helping us learn from the past about eras of rapid transition which can inform our future living experiment? 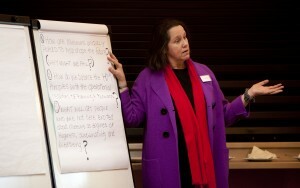 As Clare Cooper from Mission Models Money noted the energy conjured from the symposium has led to a flurry of enquiry. Ben Cowell from the National Trust has already asked whether ‘happiness’ and ‘sustainability’ one and the same concept. Yesterday Maurice Davies’ urged Museum Association blog readers to contribute to the Office for National Statistics consultation on National Well-being measures as Museums are conspicuous in their absence from the current framework. Discussions also took place around measurement and evaluation of culture and well-being. Dr Dave OBrien who has written extensively on cultural value noted that despite an acknowledgement of the well-being effects of cultural activity, hard evidence upon which to base policy was not robust. Demos Associate, Shelagh Wright spoke about the need for ?evaluation that is about genuine learning and not advocacy? which values impact rather than growth. 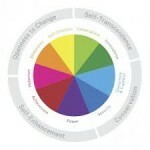 She described the Values and Frames emerging from Common Cause a coalition of environmental and social justice NGOs and psychologists seeking to achieve the holy grail of behavioural change through campaigns based on shared values. For its part the Happy Museum Project’s evaluator Mandy Barnett is using the Theory of Change model to assess the overall project and each organisation has been asked to select its own methodology for their respective projects . Social Return on Investment is the London Transport Museum’s and Cinema Museum is using the Outcome Star to examine the impact on their organisation and participants. I recognise that many museums already appreciate their position in their community and many combine this with scholarship, stewardship, learning and a desire for greater participation. What the Happy Museum Project is trying to do is to show that the context is now different. Environmental change, pressures on the planet’s finite resources and awareness that a good, happy society need not set economic growth as it most meaningful measure offers a chance to re-imagine the purpose of the museums. Museums should realise their role as connector, viewing people not as audiences but as collaborators, not as beneficiaries but citizens and stewards. Over the next few weeks on the Happy Museum blog each of the museums will be interrogating the principles in depth and there will be a much fuller report of the proceedings and presentation at the event. Please contribute to the conversation thorough the Happy Museum website or your own blogs. As Bridget McKenzie noted in thelearningplanet. The commons is a principle that should be applied to both our biosphere and our digitally-powered knowledge sphere, and both need preserving as heritage and nurturing as new growth.